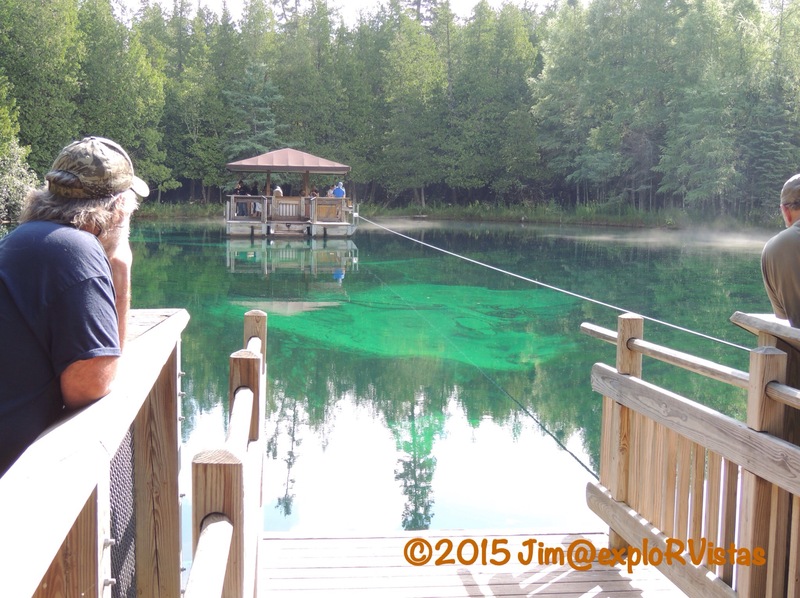 Just west of Indian Lake, near the town of Manistique, Michigan, lies a natural freshwater spring named Kitch-iti-kipi. The Native American name roughly translates to mean ‘big cold water’. From it’s porous limestone and sand base, approximately 10,000 gallons of water a minute bubble into the emerald body of water. From there, the water flows into Indian Lake, which empties through the Indian and Manistique Rivers into Lake Michigan. 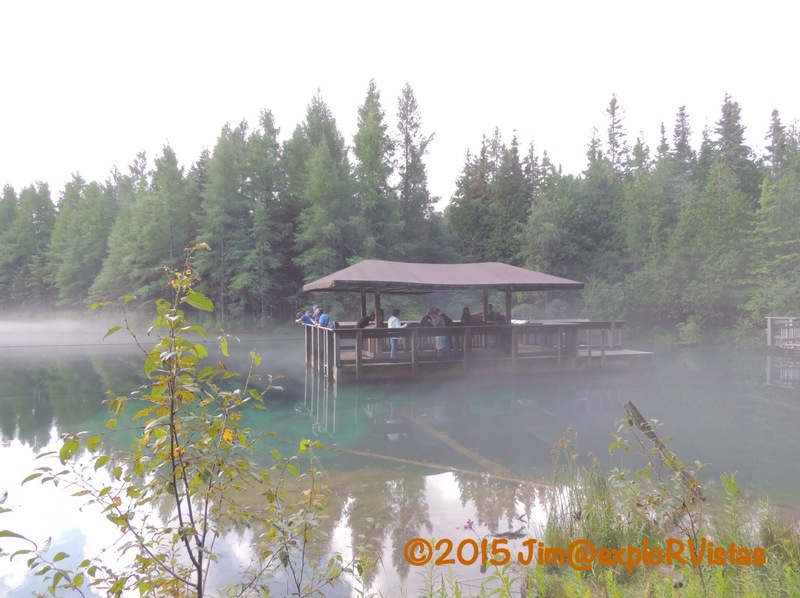 It was the early 1920’s when a Manistique dime store owner named John I. Bellaire saw Kitch-iti-kipi for the first time. Buried beneath a tangle of fallen trees, the spring was adjacent to a dumping area from a nearby logging camp. Mr. Bellaire recognized the potential of the spring and convinced the owners, the Palms Book Land Company of Detroit, to sell it to the State of Michigan for the hefty sum of $10. Part of the deal was that the spring would forevermore be kept a public area and be known as Palms Book State Park. The Civilian Conservation Corps constructed a hand propelled raft on a cable in the 1930’s. But that was not the first raft at the spring. 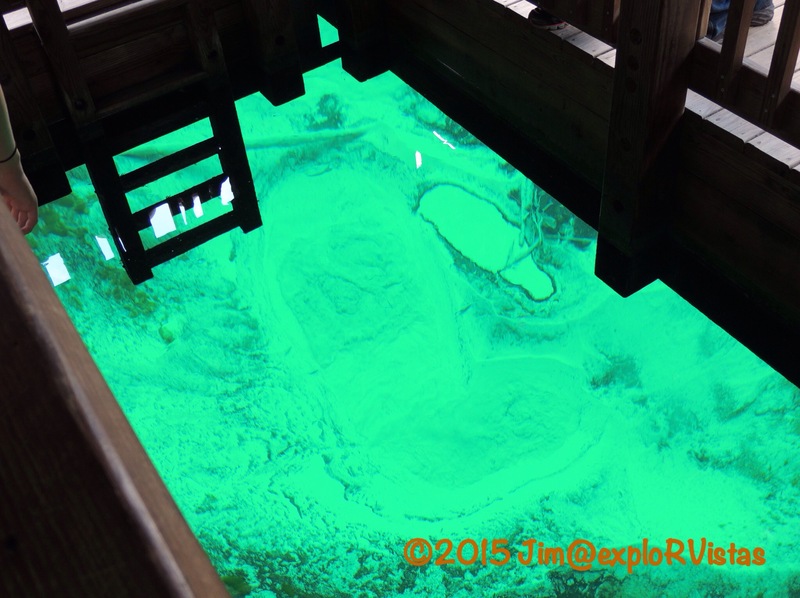 In the late 1800’s, this vessel was constructed to take visitors across the 45 foot deep pool. Why it transitioned from a tourist spot to a logging dump prior to Mr. Bellaire’ discovery is unclear. 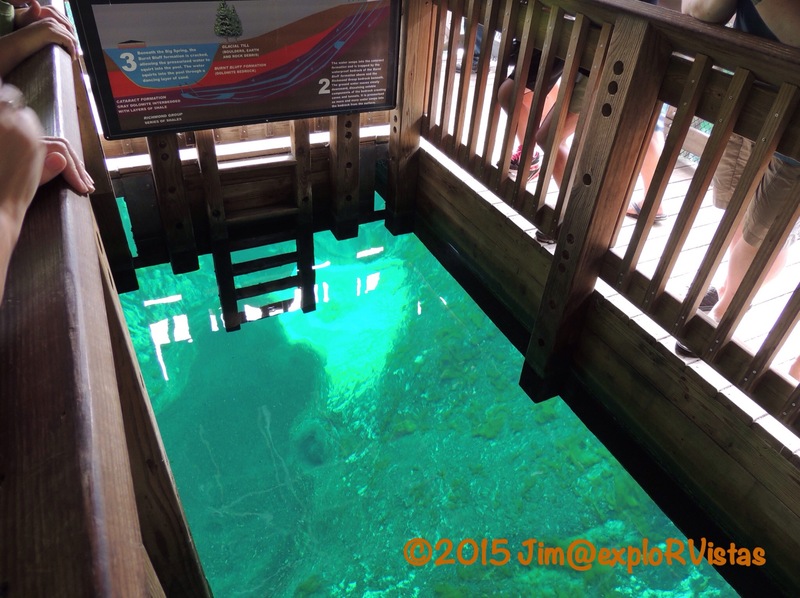 Once it became a state park, more and more tourists came to Kitch-iti-kipi. Mr. Bellaire could be seen at the site well into his 70’s, as he was fascinated by the spring. Even though the current raft is much larger, it is still human powered. There is a large boat davot wheel that passengers takes turns spinning to move the craft along the cable and across the water. The kids on our voyage really had fun acting as the pilot. There is no park ranger present, yet the entire process stays very organized. The cable that runs above the spring can be seen in this photo, as can the bottom of the pool. That white sand bottom is 45 feet down! The center of the raft is open. With the canopy over the top providing shade, visitors enjoy an excellent view of the spring. There were several large fish, but they refused to pose for my camera. Near the center of the pool, the force of the water could really be seen. Imagine filling a 25 foot round by 5 foot deep swimming pool every minute. That’s a LOT of water! And with it being a constant 45 degrees, it doesn’t freeze in the winter. That wraps up our current tour of Michigan’s Upper Peninsula. Our focus on this trip was the Porcupine Mountains, so we skipped over several points of interest that we have seen in the past. We could have easily spent the summer here and not seen everything. The U.P. is a wonderful place to explore, and we highly recommend taking the time to discover it for yourselves. What a very cool spring! I can’t get over how clear it is. I love that they are still using a people powered raft! One of my fav spots. I really wanted to jump in because it was so clear. If it weren’t so cold Camilla, that would be a great swimin’ hole! Are you allowed in the water? We say that same thing about Leelanau! We have stayed here a week at a time in the past and have seen more then than we have being here all summer. We just made it out to the Old Mission Peninsula for the first time this year yesterday! P.S. : I like the new picture of the rig! Thanks again, Peter! Yours (including your trunks) looks great also! your 2014 theme allows you to use randomly changing header images. Be brave. What a cool raft..lI love that!! Tom’s mom and dad introduced us to this beautiful spot and on a camp out introduced members of Andy’s Boy Scout troop to the spring. We love the UP! Have fun on your travels Jim and Diana.